Scorpions are easily identified by their segmented tail tipped with a venomous stinger and their prominent claws. Like spiders, they are arachnids and have eight legs. Despite their fearsome reputation, only 25 of the roughly 1700 species of scorpion are considered dangerous to humans. Did you know scorpions glow under ultraviolet light? It’s true: due to a chemical in their exoskeletons, they will shine a bright blue under a UV lightbulb. No one is exactly sure why. Scorpions are found on every continent except for Antarctica. While they were not always present on island countries like Japan or Britain, they have since been introduced by trading vessels. Like all Safari Ltd products, this figurine has been individually hand painted, features quality construction from phthalate and lead–free materials, and includes an educational hangtag in 5 languages. Realistic, educational, and fun, this figurine is suitable for a range of interests, including collectors, enthusiasts, teachers, and kids. Admire it on a shelf, use it in the classroom, or simply enjoy playing with it. The scorpion is about 7 ½ inches long with its tail fully extended, and 3 ½ inches wide. It’s about as wide as a deck of cards and slightly longer than the width of a standard sheet of notebook paper. It features new and improved paint detail including a dark brown carapace with medium brown legs, claws and tail. 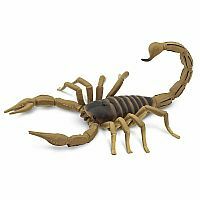 STINGY YET SAFE: Scorpions are easily identified by their segmented tail tipped with a venomous stinger and their prominent claws. Like spiders, they are arachnids and have eight legs. Despite their fearsome reputation, only 25 of the roughly 1700 species of scorpion are considered dangerous to humans. GLOWING REVIEWS: Did you know scorpions glow under ultraviolet light? It’s true: due to a chemical in their exoskeletons, they will shine a bright blue under a UV lightbulb. No one is exactly sure why. Scorpions are found on every continent except for Antarctica. While they were not always present on island countries like Japan or Britain, they have since been introduced by trading vessels. 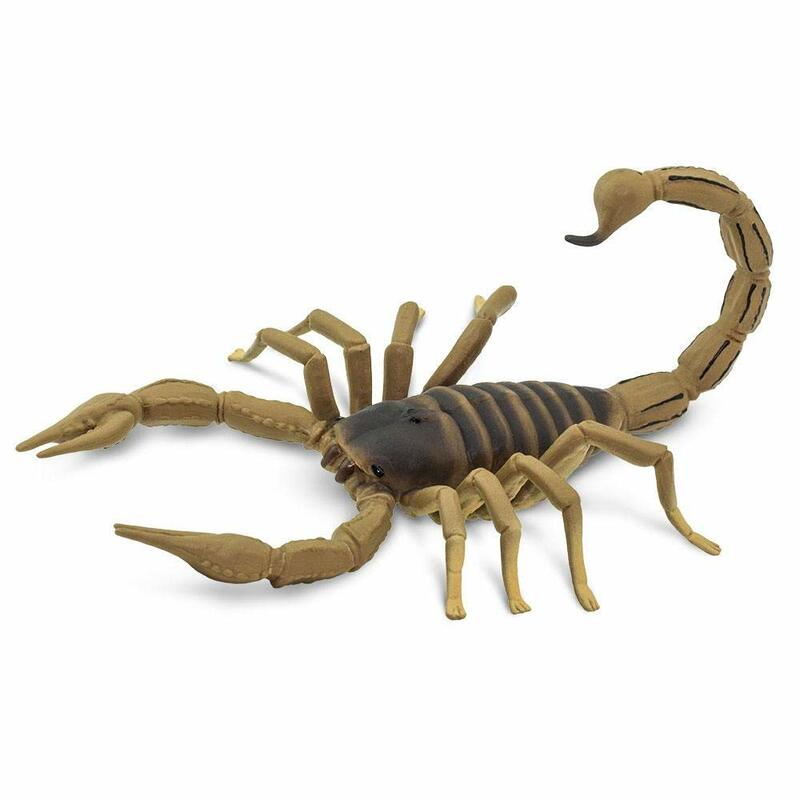 PRODUCT SPECIFICATIONS: The scorpion is about 7 ½ inches long with its tail fully extended, and 3 ½ inches wide. It’s about as wide as a deck of cards and slightly longer than the width of a standard sheet of notebook paper. It features new and improved paint detail including a dark brown carapace with medium brown legs, claws and tail.